Native Australians believe that the dream world (dreamtime) is "realer" than reality. They may be right. In the real world, we are realistic. We solve practical, everyday problems using our conscious, logical minds. But when we dream, our unconscious minds take over. In the dream world, we are surrealistic. The linear flow of time breaks down, and images and relationships become illogical, often bizarre. While our conscious minds deal with waking reality, our unconscious minds give vent to our more instinctive thoughts and feelings. Good artists in all media know how to access their unconscious mind. It's the wellspring of human creativity, and its language is universally understood. This is why I agree with aboriginal Australians that dreamtime is at least as real as waking reality. The language of the dream world is also the language of art and myth. 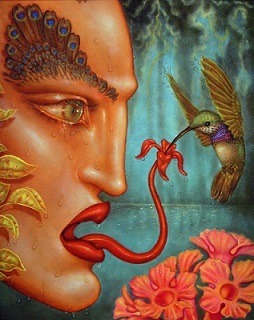 Although surreal art is as old as mankind, Surrealism as a cultural movement is much newer, dating back to the 1920's. The founding Surrealist artists and writers, such as Salvador Dali and Andre Breton, regarded their work as a philosophical movement, establishing new standards for art and literature. Surreal artists desire, above all, a free flow of material from their unconscious mind to their art. The hallmark of their work is a jarring juxtaposition of ideas and/or images that resembles those in dreams and nightmares. 2. Bizarre or illogical juxtaposition of ideas or images in a thought-provoking way. 3. Non-linear flow of time. 4. Breakdown of logical thought. 5. Symbols or archetypes that speak to our conscious as well as our unconscious minds. 6. A dark and/or ironic sense of humor. In surrealism, ideas often manifest as archetypes (universal symbols), making it possible for surreal art and literature to be understood by everyone. Deep psychological truths and connections may be revealed in symbolic form. 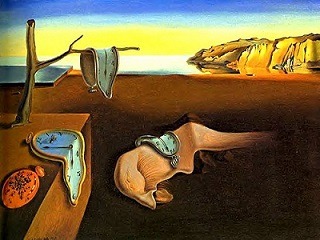 Salvador Dali suggests this connection in what may be the best-known of all surreal paintings, The Persistence of Memory (above). The clue to this jarring image lies in the title. As suggested by his melted clocks, the past is gone forever, except in our memories. But when we sleep (as suggested by the sleeping walrus-like creature) our mind makes sense of our memories by ordering them and converting some into archetypal symbols. A clinical study recently demonstrated that, while asleep, we replay our dreams many times, gradually reducing the emotional content and increasing the symbolic content. French writer Arthur Rimbaud (forefather to the Surrealist movement) takes a simple plot-- a boat-ride down a river-- and turns it into a lucid nightmare. In his poem The Drunken Boat, crew members die at the onset, but this doesn't concern the narrator, who wants his boat to drift so he can explore uncharted waters. Logic and linearity are discarded, a clue that we are entering surrealism. Devouring the green azures... entranced in pallid flotsam. Rimbaud's wildly creative language amazes me, even in translation. The poem of the sea? There's no way that these words originated in his conscious mind. Notice how he uses only two words (which aren't normally used together)-- "pallid flotsam"-- to conjure up a floating, moonlit corpse. Drowning is a theme here as well, but it's only part of the story. This is an evocative picture of a psychiatric hospital visit, complete with a look inside the heads of both the visitor and the patient. Kilbey's point of view is deliberately enigmatic-- the anxious visitor may see a deluded woman, while the patient seems to see the hospital as her palace and her bathtub as a sea inhabited by mermaids. What about traumatic events (and their resulting dreams) that cannot be reduced to symbols and/or archetypes? In my experience, these are particularly difficult to resolve. When society experiences important events that cannot be understood as existing archetypes, it's up to artists to create new ones. 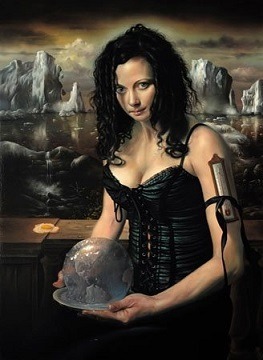 Above, David Bowers does just that in his portrayal of global warming as a femme fatale. 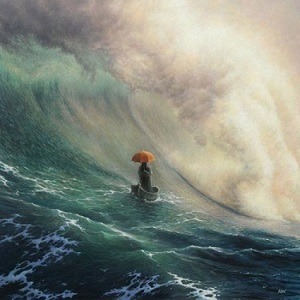 This artist suggests that global warming is a lethal event driven by our greed and lust. 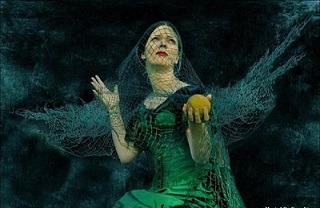 Surrealism is a particularly relevant art form in times of turmoil and social upheaval. What is the current state of our governmental gridlock if not surreal? I think Derek Nobbs (above; notice the background pattern) agrees with me, as he portrays one of the most frightening archetypes I can imagine-- a cruel and nihilistic ruler, in this case with his head emptied of all knowledge. Photo credits: 1. Virgo Paraiso, A Taste of Paradise; 2. Untitled by Maura Holden, 3. The Persistence of Memory by Salvador Dali, 3. 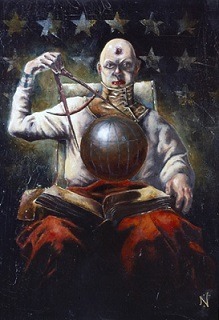 Untitled by David M. Bowers, 4 and 5: Artists Unknown 6. A Hole in the Head So All Knowledge May Pass by Derek Nobbs. Copyright 2013 by Ann Marcaida.